Microgaming's announcement of their brand new video slot brings back great memories while everyone is getting ready to enjoy energetic winnings. Titled "The Heat Is On" the game immediately remind of the soundtrack used in the Beverly Hills Cop film starring Eddie Murphy as a Detroit cop shaking things up in California. The Heat is surely on across 45 paylines and 5 energetic reels, and while the beat is inside your head, it's time to remind you that the game can be enjoyed on mobile, tablets and desktops. The cop theme is complemented by cartoon style symbols such as suitcases filled with gold bullion's, police chases, helicopter searches, high explosive bombs and poker symbols. New Heat Is On slot invite players to join the cops and fight crime by their site as the pressure is high and while it is easy to get caught up in all the action bonus features keeps a lookout on increasing your bankroll. Special features include wilds, scatters, and loads of free spins. The thief wilds substitute for others to find a faster path to rich reel robbing while the female policewomen go wild to chase him and also substitutes for the symbol in her way to making an arrest. The wild chasing awards up to 10,000 coins should a payline contains 5 identical wilds, while a mixed line of wilds still rewards up to 5,000 coins. While you will feel the heat for sure, the aim is to catch a scatter on the second and third reels during the free spins bonus round as it will double your free spin quantity. To trigger the free spins bonus round you need to line up scatters on reels three, four and five at the same time and the number of free spins could be as high as twenty. During the free spins round scatters on the second and third reel will quadruple your number of spins to 80 free spins and if you catch the same action aging your free spins could potentially end up being 160. The Heat Is On, and it is on the reels indeed while the rewards are definitely in the free spins bonus round, while the game offers some exceptional wild surprises. 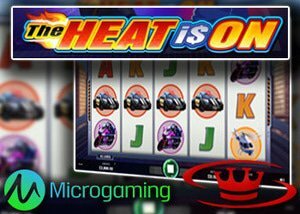 The Heat is On video slot can be enjoyed free with a Microgaming no deposit bonus. The no deposit bonus is offered at casinos such as Slot Boss Casino. To qualify for the free no deposit bonus, register a new account today, and once the fast, easy process is completed, you will be credited the $10 to spend on any game.